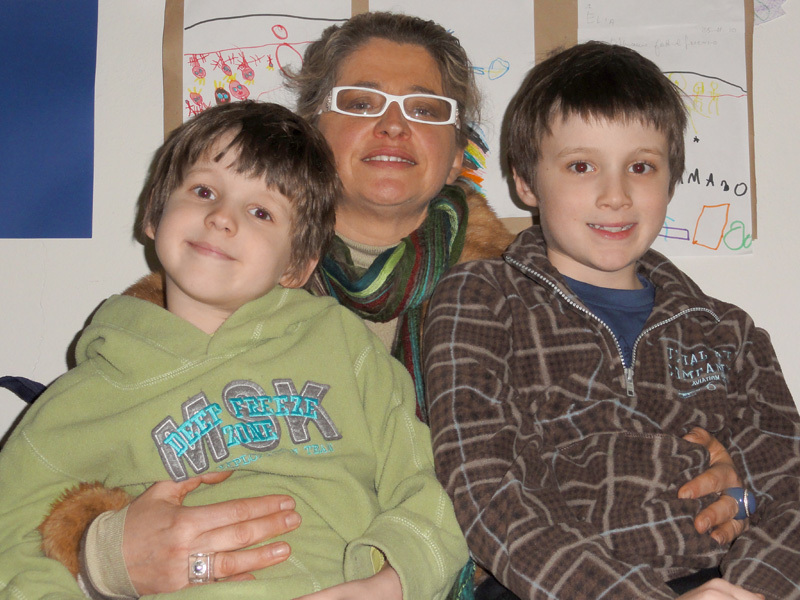 …..and meeting lots of new people! Sometimes it pays to spend an inordinate amount of time on Facebook, because you never know what you’ll discover or who you’ll meet. It was on Facebook that I “met” Bianca (the lovely owner of this house) and also where I read about the planned night time opening of the Castello Malaspena at Fosdinovo. 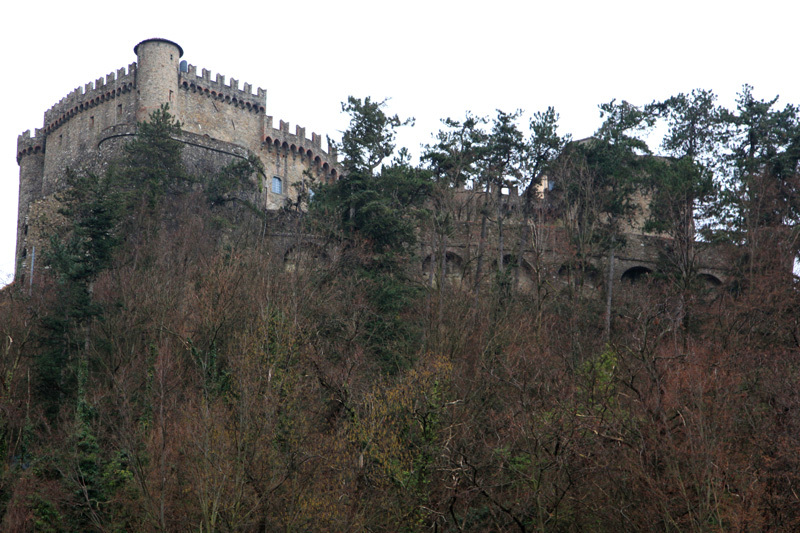 You might remember from a recent blog entry how we visited Fosdinovo one icy cold day, only to find the castle closed. You can imagine my interest when I saw the announcement in my Facebook news feed that they were planning to open the castle for a special night tour. I immediately phoned and booked us in on the “early tour” – 9pm. It meant picking up the kids early from school in order to arrive in Fosdinovo in time for dinner and to find some suitable overnight accommodation. 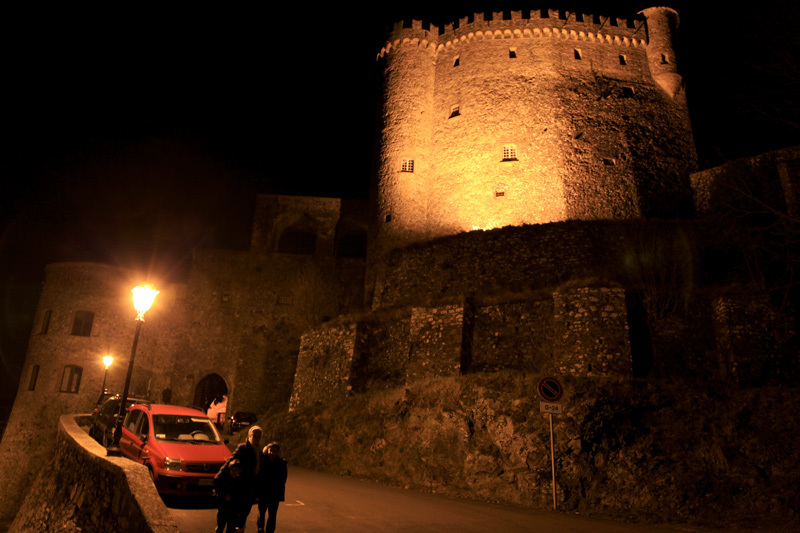 It would have been too late to drive back to Bagnone that same night, especially on such narrow and treacherous roads. We arrived in Fosdinovo at around 7, and wandered around looking for a lady called Monica who we had been told owns a local B&B (as well as the local jewellery shop). We found her and, although she was technically closed for the winter months, she agreed to let us stay for a reduced rate. Great! We then set off in search of a restaurant. Fosdinovo is one of those very steep villages, where all the roads are narrow, winding and very hard on the thigh muscles. We walked all over and could not find one single Restaurant open. In fact we could not find ANYTHING open! We asked the first person we saw and they confirmed that we would have to leave Fosdinovo in order to find a Restaurant. 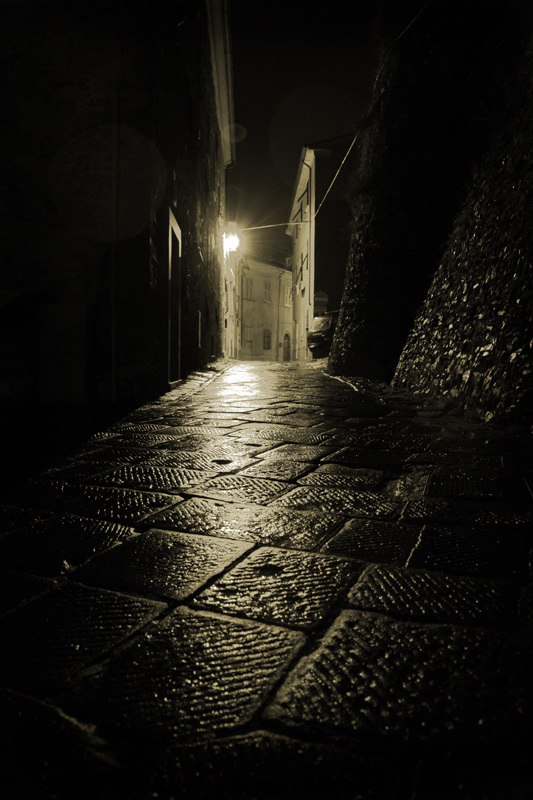 The deserted streets of Fosdinovo. Any enterprising Restaurateur could make a killing here!! Off we went, back to the car, back down the road to Giucano where we had heard of a Restaurant that was supposed to be good. After a pretty hairy parking experience, we found Ristorante Emili and enjoyed our own personal dining room (ie, no other guests around). 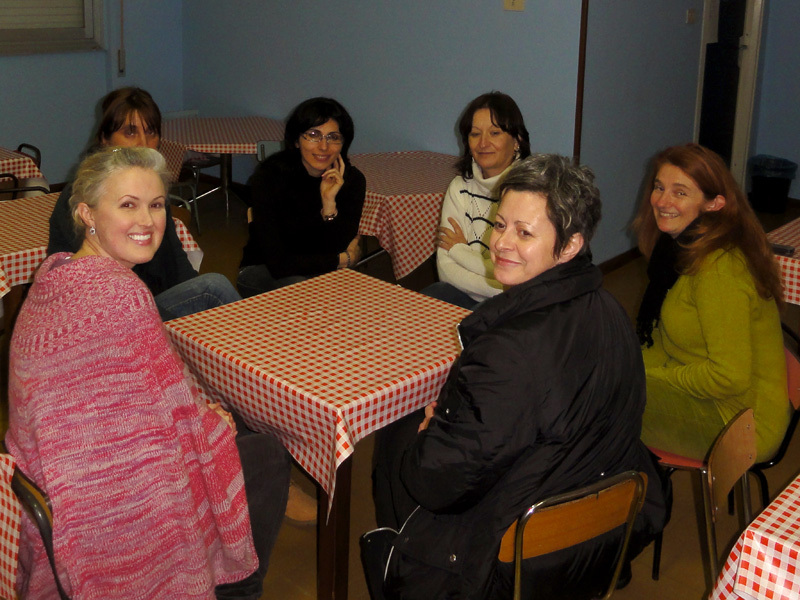 The food was fabulous and we enjoyed HUGE Sgabei (hot, crispy, fluffy and salty….mmmmm!) and various pastas and meats. Unfortunately, by this time it was fast approaching 9pm so we had to hurry our dinner a bit. We managed to be back at the castle by 8:55. We sat outside the door on a cold stone bench within the castle walls and waited…..and waited….and waited. Did I mention it was cold? It was bloody freezing! Castello Malaspena in Fosdinovo, lit up at night. Finally, at around 9:15 (more than enough time to eat desert IF we’d known we had time!!) a little old grey-haired lady opens the door and beckons us inside. No explanation or apology for tardiness, just our payment and then on with the candlelit tour. Unfortunately, our guide did not speak one word of English, so it required my full concentration to understand her and be able to ask questions. I suppose that the castle at night is an entirely different creature than the castle during the day. To be sure, it had an atmosphere of dark foreboding and it was all too easy to imagine it’s resident ghosts shimmering in the shadows of the flickering candlelight. 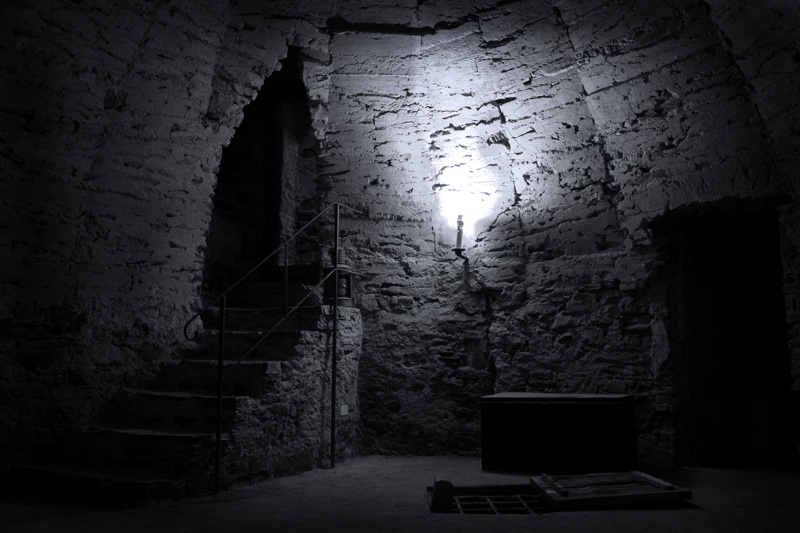 We were led on from one huge cavernous stone hall to the next and finally into some enormous rooms. As lovely as castles are, living in one would not be much fun in winter. It was very cold in there, and our guide chatted on regardless telling us of the various legends and the lives of the people who once dwelled there. 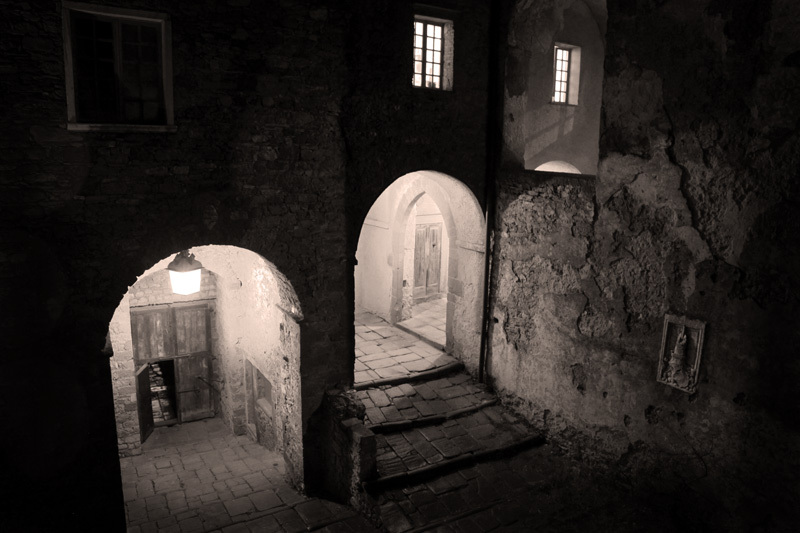 She pointed out where ghosts had been sighted, and led us on through very narrow winding passages which you could easily become lost in. A few times Chris stopped to take photos and the lady seemed very concerned to hurry him on. 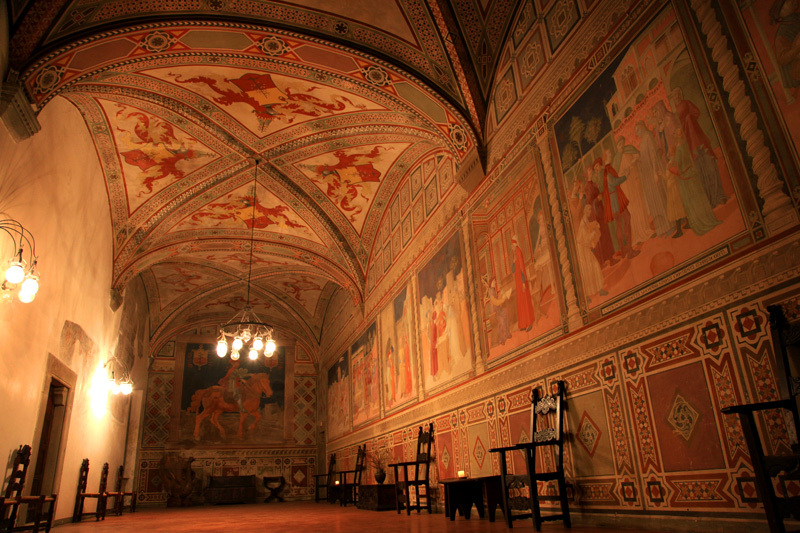 Of all of the rooms, the highlight for me was the great hall with its painted walls and huge arched windows. 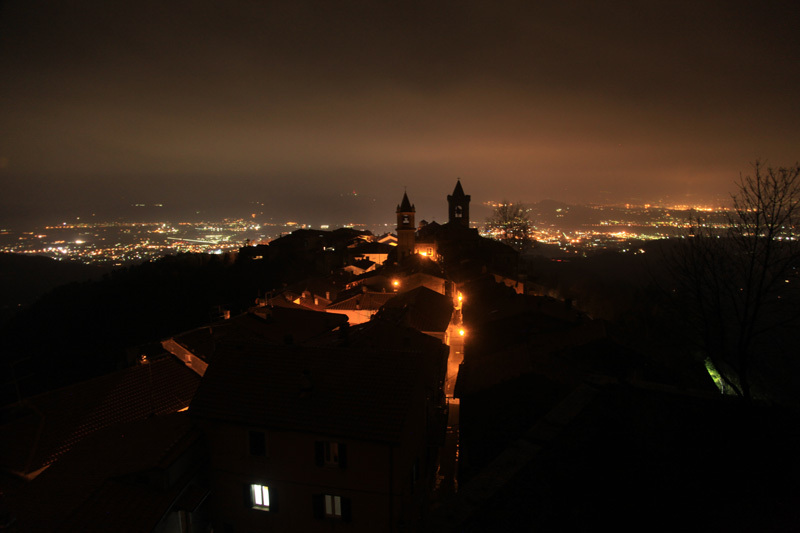 The views from the castle over Fosdinovo and towards the sea were quite spectacular at night. 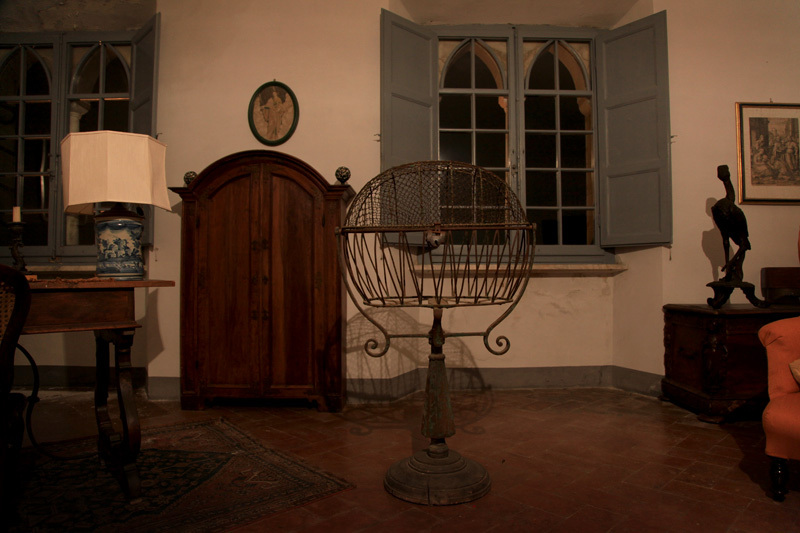 One of the bedrooms. That metal object is actually a cradle for a baby. It has a lock on it, and was only used for male babies as they were considered to be most precious! Apparently this is a haunted bed. 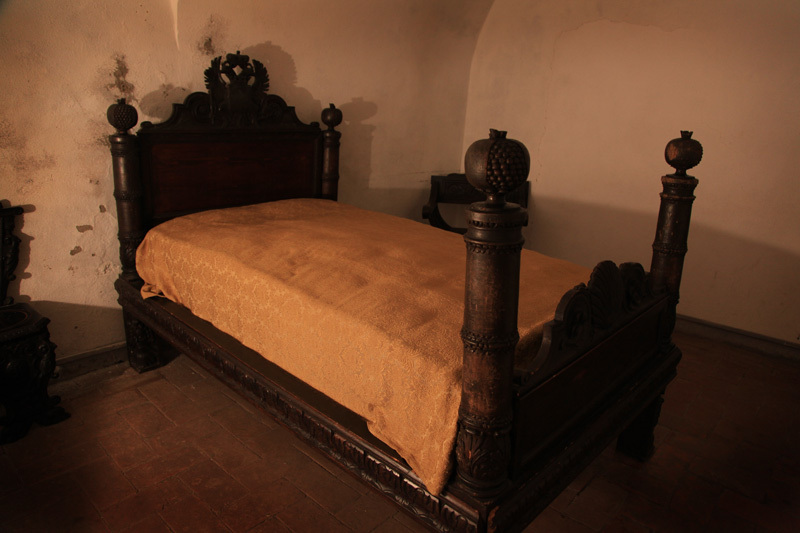 If you were going to haunt a bed, then this would be a good choice....look at that gorgeous carving! Of course a castle is not worth its salt if it doesn’t have some gory tales, and this one had plenty. 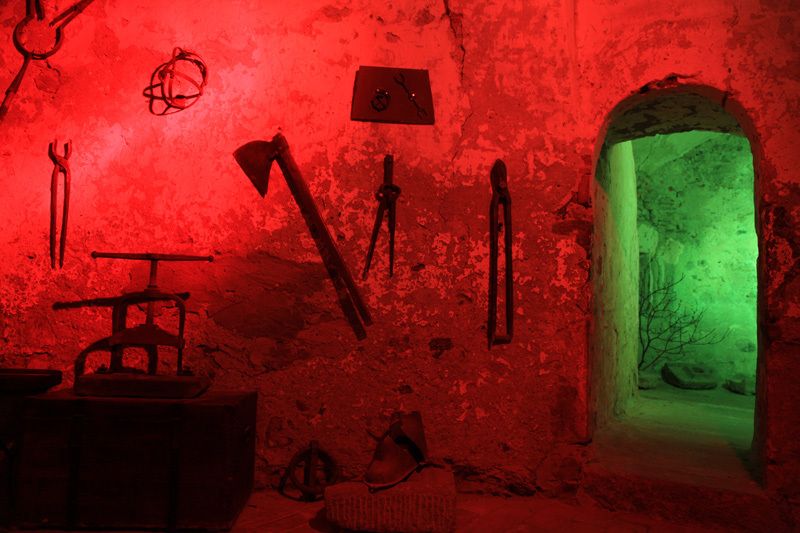 We were taken deep down into the dungeon where our guide described the various tortures that were performed there. There was a grate in the floor where the dismembered body parts were disposed of. We were also shown into a room with all of the various torture implements on display. Unfortunately, I now know what they were all used for and so does Balin! It was the first time I’ve rued his growing knowledge of the Italian language. The dungeon. It was a very creepy feeling being in there! An oppressive atmosphere of doom. The torture implements. Top marks for creativity though, some of those items had uses I would never have imagined! We finished the tour and went back to our accommodation, a charming little B&B on the outskirts of the village. We awoke in the morning to a very different view of the castle from our bedroom window. The castle the morning after. 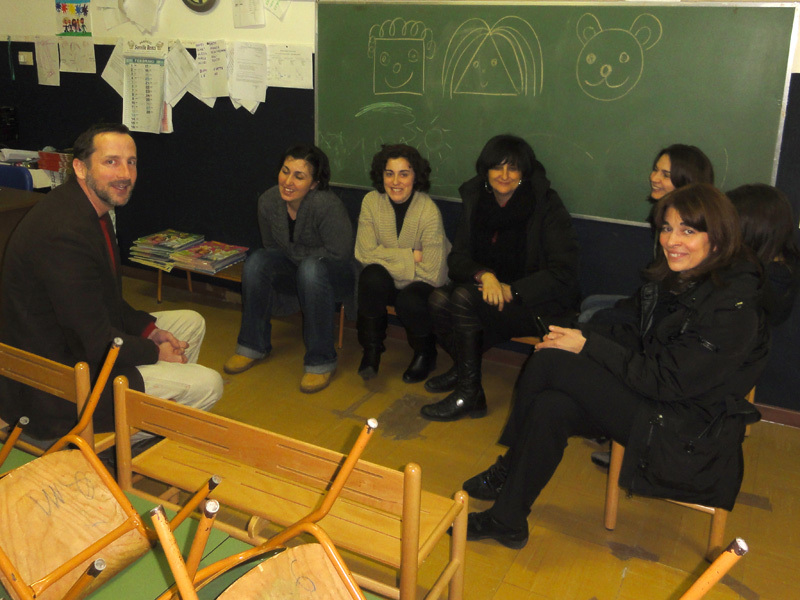 This week, our good friend Lucia invited us to help her with a class of fellow teachers who are learning English (as part of a compulsory government program). We were very happy to oblige, as Chris and I are both certified trainers in Australia and it felt good to contribute our skills so far from home. The students needed to listen to the English language spoken by native speakers so that they could get used to the sound and try to understand the words. Chris and I highlighted the differences between pronunciation of words in America and Australia and we spent some time talking to them about ourselves and our lives before breaking off into smaller groups where the students could practice speaking to us. I have to say, they were all very good at English for having only studied for a short time. 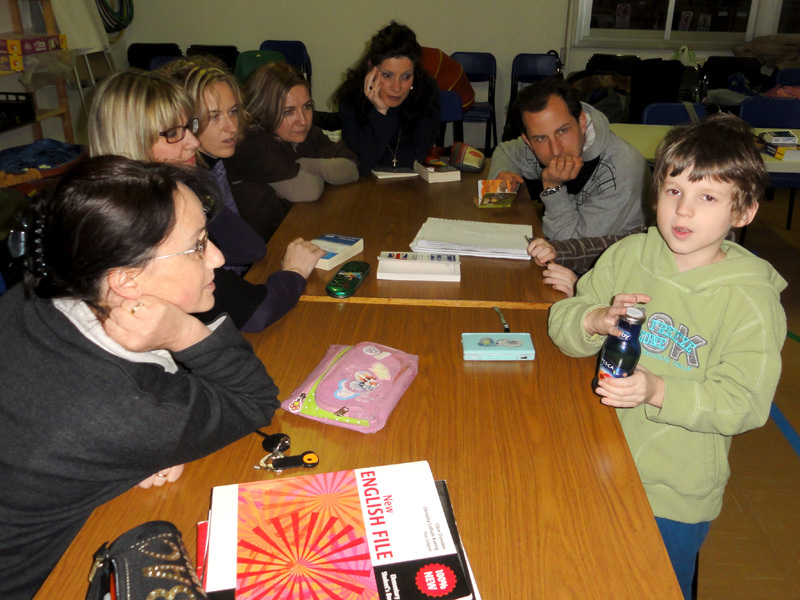 As we have noticed amongst Italians on previous occasions, they are very shy and lack confidence in their linguistic ability, but we soon had them chatting to us. Actually, I would be happy to be able to speak Italian as well as some of them can speak English. Even Balin and Denver had a small group to themselves and had some good conversation going. Balin even SANG to the group! It was great fun. Balin (out of shot) and Denver holding the attention of their students. They did a great teaching job! I will leave you with a cute pic! 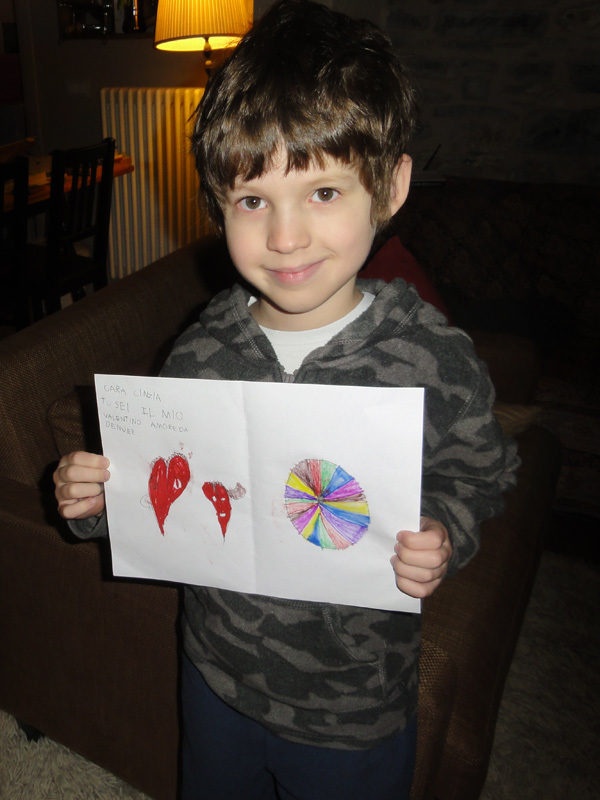 It was Valentine’s Day on Monday and the boys made special cards for their respective girlfriends at school. Denver has a new girl in his heart now and her name is Cinzia (chin-zee-ah). He went to some trouble making a very pretty card for her, and apparently it was well worth the time and effort. When we asked him how it went when he gave it to her, he smiled smugly and said matter-of-factly “She loves me.” Of course she does! Who wouldn't love a face like that? 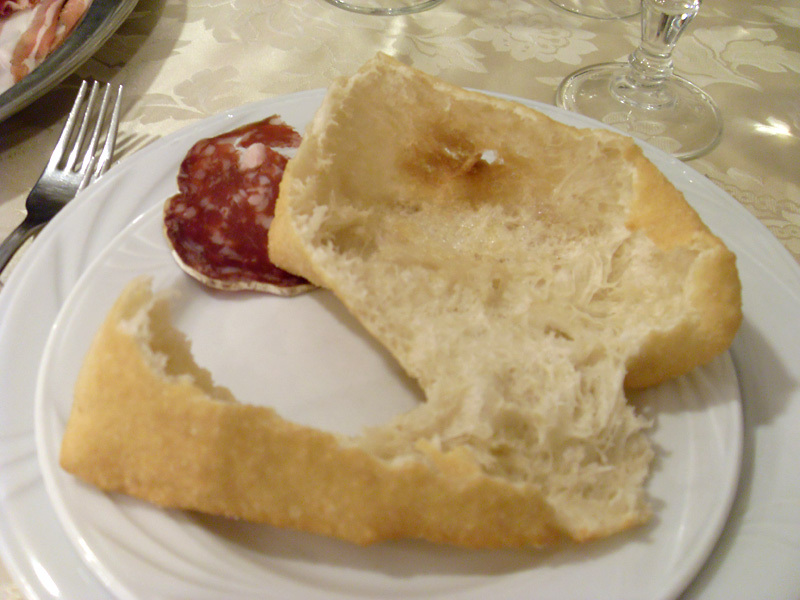 This entry was posted in Uncategorized and tagged aulla, Aussies, Australia, bagnone, bed and breakfast, castles, cooking, English, expat, food, fosdinovo, ghosts, groppo, italian, Italy, language, Lunigiana, massa carrara, photograph, photography, recipes, travel, Tuscany, valentines, weather. Bookmark the permalink. I look forward to your new posting each week and this week’s was particularly interesting. We too have always found the castle at Fosdinovo to be closed whenever we are there (usually on our way to/from the airport at Pisa). Fosdinovo is a good place for its sea views and we like to stop off at the cafe there to relax after / before a flight. The mention of a nearby eating place was useful and we’ll give it a try out before our summer guests arrive. Keep up your recommendations! The restaurant at Ponticello was brilliant, just as you said. Thanks! You’ll love Ristorante Emili, the sgabei there was really yummy!! Good service too 🙂 I only write about the really good restaurants. Actually Il Faro near Fosdinovo (mentioned in the other Fosdinovo post) was fantastic too. Now that’s an entrepreneurial thought! I don’t know whether the atmosphere would be conducive to a good appetite though.